Verani Realty staff, agents, and special guests gathered at the Castleton Banquet and Conference Center for a night of dinner and dancing to celebrate the brokerage’s top performers of 2017. Verani Realty’s Londonderry headquarters walked away with two of the top awards of the evening – commercial agent Tom Duffy was named the #1 producing agent of 2017, and Team Tringali, made of up agents Danielle and John Tringali, was named the #1 producing team. Verani Realty’s Nashua office also earned top honors, winning Office of the Year. 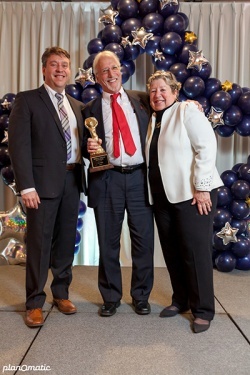 The annual Ozzie awards are a way to honor Verani Realty Founder Osvaldo Verani (who was known as Ozzie to all) as well as recognize agents who have achieved high performance as determined by gross commission income (GCI). The award statue was originally designed and created by Patricia Verani, Osvaldo’s wife and a noted local artist, and it is the same statue that is given out to award winners today. Tom Duffy was named Verani Realty’s top producing agent for 2017. He has been the top commercial specialist for Verani Realty in Southern New Hampshire and Northern Massachusetts for the last 23 years. He specializes in multifamily properties and industrial locations, is a leading waterfront real estate specialist for his home area of Pawtuckaway Lake, and is a certified real estate brokerage manager. In 2010, he was named New Hampshire’s 2010 Commercial REALTOR of the Year, and he is a former President of the Commercial and Investment Board of REALTORs (CIBOR) in New Hampshire. When not busy with real estate, Tom volunteers with the Ukulele Kids Club, a nonprofit dedicated to supporting hospital-based music therapy programs by providing ukuleles to kids. He is currently co-chair of their National Board of Directors. Danielle & John Tringali of Team Tringali were named Verani Realty’s top producing real estate team of 2017. They have over 20 years of combined experience in the legal, insurance and real estate fields. 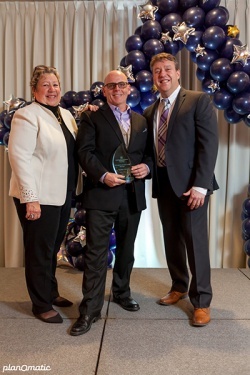 Known for their passion, out-of-the box marketing style, and strong negotiating skills, they are repeat top performers and have won awards both with Verani Realty and the national Berkshire Hathaway HomeServices network. Most recently they received Berkshire Hathaway HomeServices’ 5 Year Legend Award, which recognizes agents who have achieved their highest tier of recognition, the Chairman’s Circle, for multiple years in a row. They are Certified New Homes Specialists, Certified Buyer Representatives (CBR), Relocation Certified, and Berkshire Hathaway HomeServices Luxury Collection certified. They are members of the National Association of REALTORs (NAR), the Granite State South Board of REALTORs (GSSBR), their local PTA, and Business Network International. The Tringalis live in Londonderry with their 3 kids. 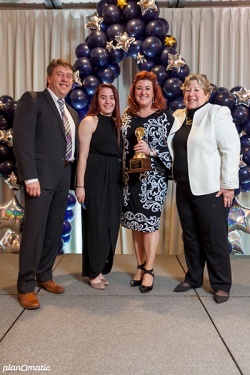 The Office of the Year is awarded to the Verani Realty location that achieves the highest percentage of its gross commission income (GCI) goals for the year. The Nashua office has 46 agents and handles a wide variety of real estate transactions in both New Hampshire and Massachusetts. The Nashua office is located at 175 Amherst Street in Nashua and can be reached at 603-888-4600. A special thank you to Residential Mortgage Services, Broker's Title & Closing, and PlanOMatic for generously sponsoring our 2018 Ozzie Awards!